Recently someone told me that if an expectant mother wants to ensure her child has an adventuresome palate, she must eat as broadly as possible during her pregnancy—the idea being that whatever she consumes is more likely to become imprinted in her unborn child’s consciousness, thereby increasing the chances that the food, the flavor, whatever, is one he or she will be willing to eat once they have a say in the matter. I doubt it’s quite that simple, though as this piece of kitchen-sink advice was relayed to me by a multiple mom, I accepted it at face value. Plus it makes sense. Part of the lore of my own childhood was that the reason I showed an early inclination for anything sour was that my mother consumed a lot of vinegar when she was pregnant with me. Who knows if there’s any truth to this theory—my instinct is that someone in the medical profession would have a more scientific explanation—but either way my obsession for all things sour has stayed with me, leading my palate towards anything with the promise of a little tang. 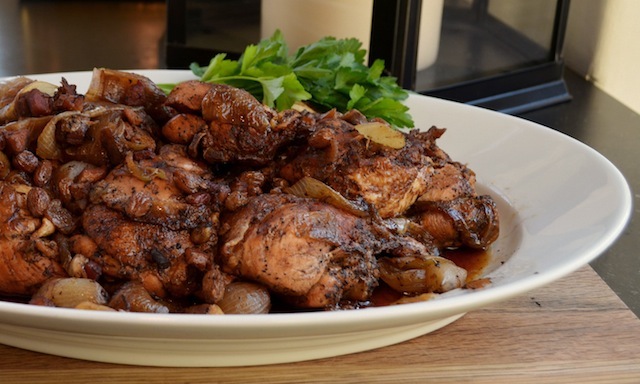 Which at least partially explains why this recipe for vinegar-braised chicken and onions got my attention when I saw it in last month’s Bon Appétit. (The rest of the reason can be attributed to the fact that it was created by the ladies behind Canal House—a seasonal cookbook series known for just the kind of hearty, unfussy cooking I’m perpetually drawn to.) 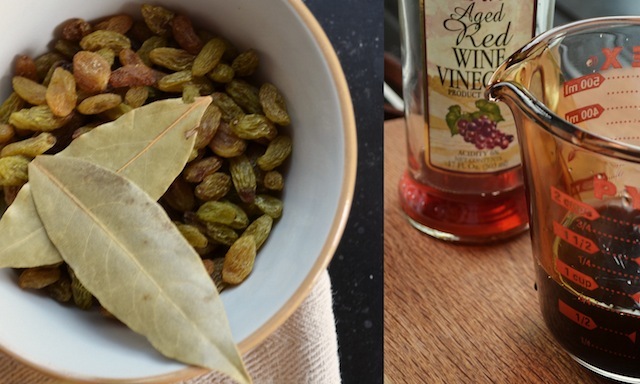 The recipe is part of a larger piece that ran in the magazine on the merits of making—and cooking with—vinegar, and while I’m not quite ready to start fermenting wine in my kitchen, I’m always up for adding an acidic kick to my next meal. I realize, of course, that’s not to everyone’s taste, but one of the appealing things about this recipe is that it combines equal parts tangy red wine vinegar and the sweeter balsamic variety, so the latter mellows the former to create a flavor that’s nicely balanced and not even remotely overpowering. 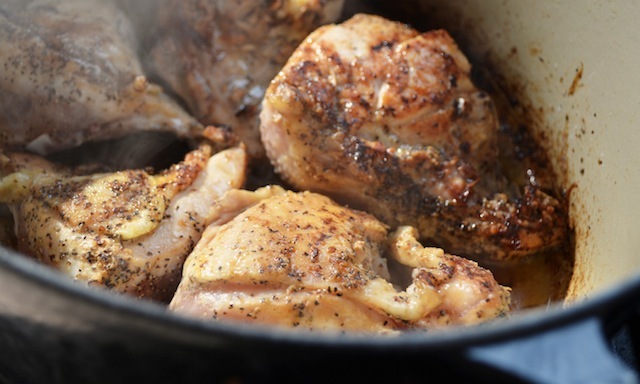 What’s more, in combination with the chicken broth, the two types of vinegars manage to imbue the chicken with a beautiful brown luster—an almost mahogany color that penetrates an eighth of an inch or so into the flesh of the chicken, and that carries the bright vinegar flavor along with it. So it’s gorgeous and delicious. 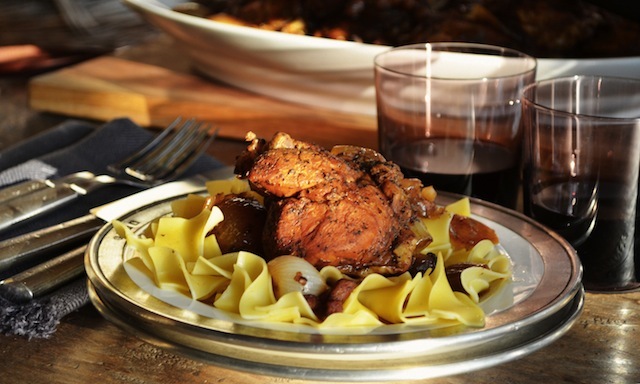 In essence what this recipe provides is a riff on that classic of French cuisine, coq au vin, replacing the all-important wine with a fermented variety (making this… coq au vinegar? ), and swapping out the carrots and mushrooms that are traditionally part of the dish for a ½ cup of golden raisins—an element that provides a nice counterpoint to the tang of the sauce, particularly as the fruit grows plump on the liquid during cooking. 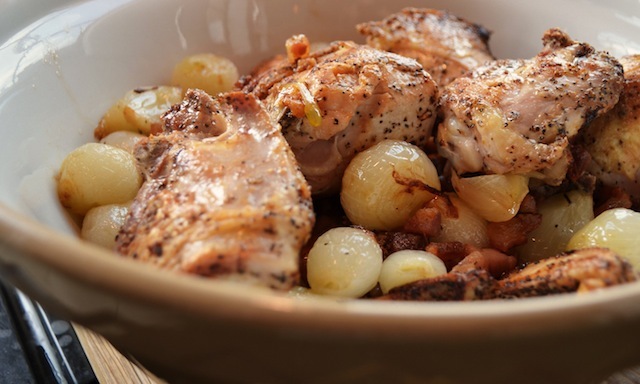 In fact, the Canal House ladies point out that braising chicken in vinegar and serving it with a handful of currants is a specialty of Lyon, so perhaps this is simply a regional variation on the French standard. 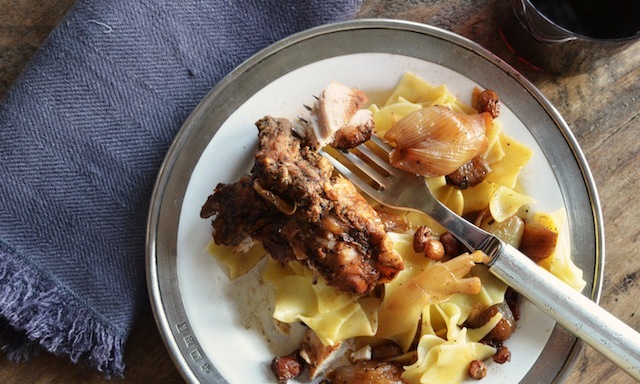 In any case, the other difference here is that unlike coq au vin, this recipe does not call for flour as a thickening agent (after its 35 to 40 minute simmer in the company of the chicken parts, the sauce is thick enough), so it’s ideal for those looking to lower—or eliminate—their wheat intake. Still, the dish’s principal selling point is its vibrant, mildly tangy flavor—a quality that’s not just due to the vinegar. For starters, there’s a ½ pound of diced and browned pancetta, which introduces a salty, rich component into the mix. And then there are the 2 pounds of boiled (and then browned) cipolline or pearl onions, which along with the raisins add a sweet note to the medley of flavors. It’s these elements, along with the chicken (seasoned with salt and pepper and browned for ten minutes or so, a step which ensures still more rich flavor) that provides the dish’s foundation, and which when mixed with the vinegar, the chicken broth, the bay leaves, a handful or crushed garlic cloves, and those raisins, makes for such a satisfying eating experience. Served over rice or egg noodles and you have the makings for a meal that’s bright, homey, and just a little decadent. In other words, you don’t have to be a vinegar nut like me to go crazy for this dish. 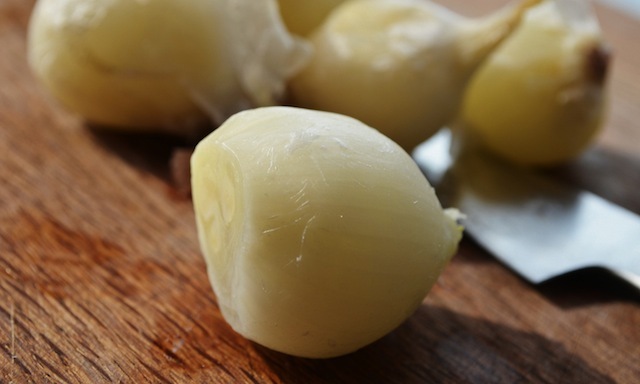 A few thoughts about ingredients: While the recipe calls for either cipolline or pearl onions, opt for cipolline if you can find them—they’re larger than their pearl siblings, and therefore easier (and speedier) to work with. Also, while it’s generally a good idea to use at least some dark meat when sautéing or braising chicken (darker meat is richer and therefore less likely to dry out during cooking), I opted to cook with breasts exclusively because I have a marked preference for the white variety. The good news is that thanks to the searing and the braising, the chicken retained much of its moisture, so feel free to use whatever parts you prefer. If you do use breasts as I did, however, be sure to cut them in half cross-wise (some people called this “French-style”) as it makes for easier serving and ensures everything is more uniform in size and therefore cooks evenly. 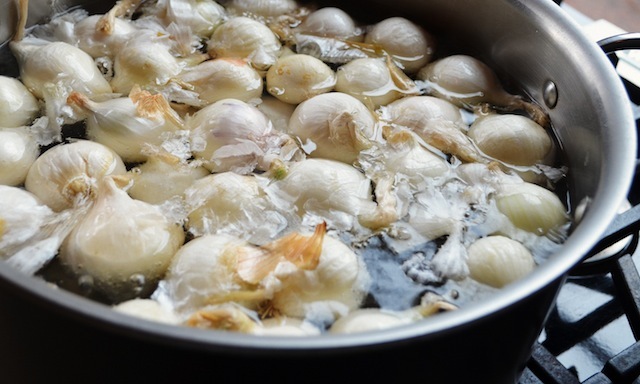 —Cook onions in a large pot of boiling salted water until tender, 5 to 8 minutes. Drain and let cool. Trim root ends; peel. —Meanwhile, heat oil in a large heavy pot over medium heat. Add pancetta to pot and cook, stirring occasionally, until fat is rendered and pancetta is brown, 8 to 10 minutes. 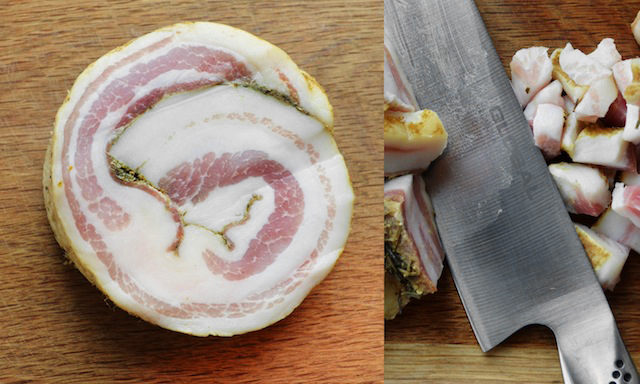 Using a slotted spoon, transfer pancetta to a large bowl. —Add onions to same pot and cook, stirring occasionally, until beginning to brown, 8 to 10 minutes. Add garlic and cook, stirring often, until fragrant, about 3 minutes. 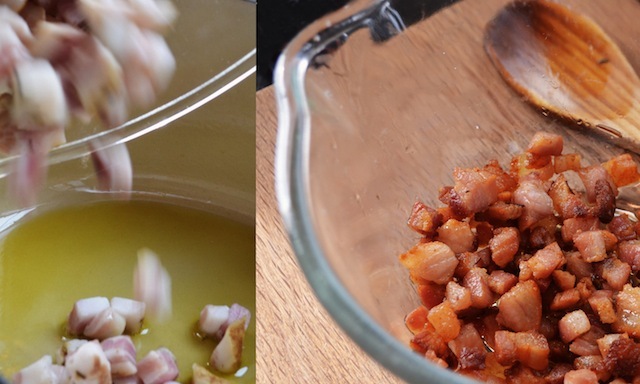 Transfer onions and garlic to bowl with pancetta. 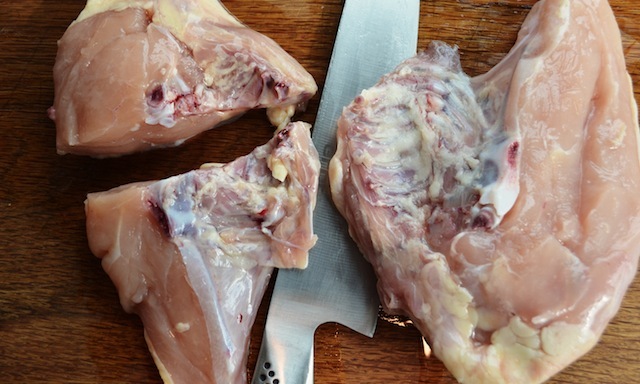 —Season chicken with salt and pepper. Working in batches, add chicken to pot skin side down and cook, turning, until browned on all sides, 10 to 15 minutes per batch; transfer to bowl with onions. —Carefully drain fat from pot and return to medium-high heat. Add both vinegars to pot and bring to a boil, stirring and scraping up any browned bits from bottom of pot. Add broth, raisins, bay leaves, and reserved chicken, pancetta, onions, and garlic to pot. Bring to a boil, reduce heat, and simmer, partially covered, until chicken is fork-tender, 35 to 40 minutes. —Using a slotted spoon, transfer chicken and onions to a large platter. 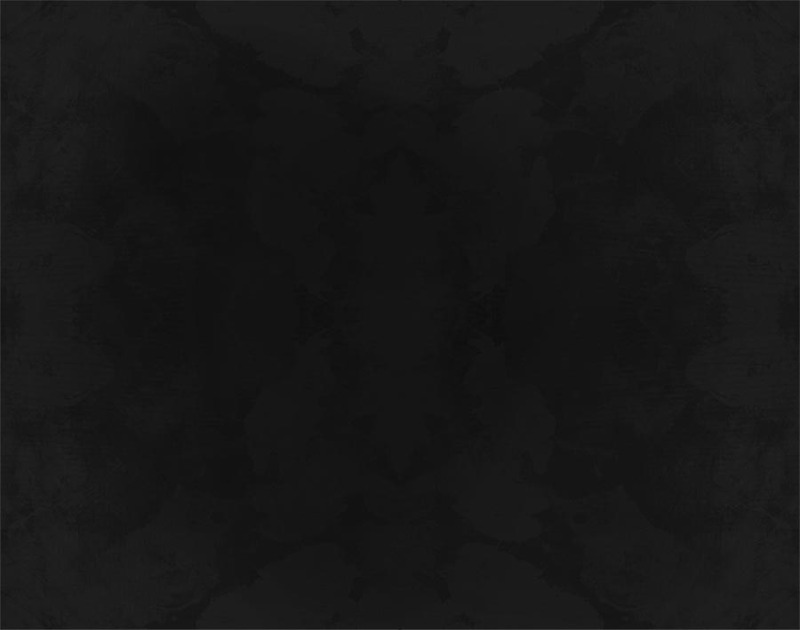 Skim fat from cooking liquid and discard. Remove bay leaves, and season sauce with salt and pepper. Spoon sauce over chicken and onions. —TRG note: Serve over rice or egg noodles to soak up the sauce.